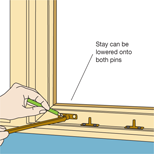 Summary: Learn how to fit a window stay and fastener, fix a stay to a casement window and install a mortise casement fastener. Window stays and fasteners are also referred to as window furniture. The most popular materials are brass, coated alloy and chrome. The window stay is a metal arm with evenly spaced holes and is fixed to the opening section of a casement window. When the window has been opened to the required position it is secured over one of two pins fixed on the window frame. When the window is closed the stay slots onto both pins. 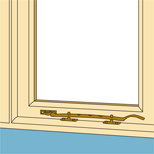 The fastener is attached about halfway up the opening section on a casement window and holds the window shut. If the casement lies flush with the frame when closed, it will require a hook fastener, but if the casement closes against the frame then you will either need a mortise or a wedge fastener. Modern UPVC frames generally come with the closing and locking mechanism pre-fixed. New timber window frames may have the stays and fasteners already attached or you may have to fit them after the frame has been installed. 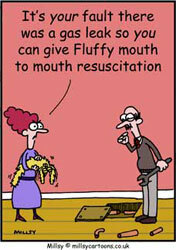 To do this - or to replace an old stay - follow the instructions below. Unscrew and remove the old stay and pin. Then fill the holes left by the fixings with wood filler. When the filler is dry sand it smooth and paint, stain or varnish the repaired area as required. If painting you will need to prime the repaired area and apply a topcoat. With the window closed, position the pins on the bottom of the window frame. The closer the fixing bracket of the stay is to the opening edge to the window the more leverage you will have when opening and closing the window. Fit the stay onto the pins. This will set the correct height for the stay. Mark the position of the stay's fixing holes on to the casement frame. Drill pilot holes and screw the stay to the casement frame. Close the window and ensure it is tight against the frame. Position the pins underneath the stay so that they line up with holes at each end of the stay. Move the stay out of the way and mark the position of the fixing holes on the bottom frame for both pins. Drill pilot holes and screw the pins to the frame. Finally, make sure the stay fits over the pins and the window is shut tight. Mark the position of the stay's fixing holes on to the casement frame. Make sure the stay fits over the pins and the window is shut tight. Remove the old fastener and fill the holes left by the fixings with wood filler. When the wood filler has dried, sand the repaired area then paint, stain or varnish as required. If painting you will need to prime the repaired area then apply a topcoat. Hold the fastener in place on the casement frame and mark the screw holes. Drill pilot holes before screwing the fastener firmly in position. 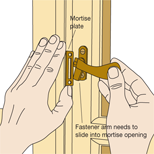 With the casement pulled tightly shut, position the mortise plate on the mullion so the arm of the fastener comes into contact with the timber that is visible through the opening of the mortise plate. Use a pencil to mark the outline of the mortise plate on the mullion along with the outline of its opening. At the same time mark the position of the screw holes. Remove the mortise plate and drill the pilot holes. Use a chisel to cut around the outline of the mortise in which the arm of the fastener will fit. Then use the chisel to carefully remove the wood within the outline to create a recess for the fastener arm to slot into. Cut the recess a little deeper than the length of the arm. With the recess or mortise cut to the required depth, cut a rebate into the mullion so the mortise plate will fit flush to the timber. Screw the mortise plate to the mullion, and check the fastener arm slots smoothly into its recess and securely holds the window shut. The arm of the fastener should come into contact with the timber visible through the opening of the mortise plate. 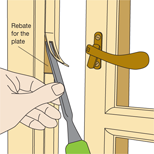 Create a rebate for the mortise plate and the fastener arm.